Tomoya and Tomoyo find interest in each other and become lovers. 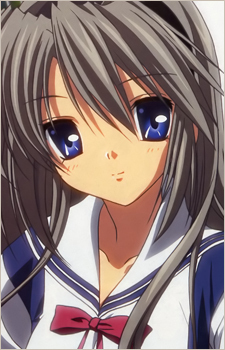 Although reluctantly, Tomoya assists Tomoyo in becoming the student council president. With Tomoyo's relationship with Tomoya spreads fast in school, the school bodies try to separate Tomoyo and Tomoya, in hope Tomoyo will concentrate more in her position. With Tomoya worrying about his delinquent status will hold down Tomoyo, Tomoya reluctantly breaks up with Tomoyo in order to let her keep moving forward. After several months, Tomoyo meets up with Tomoya, telling him that she successfully saved the cherry blossom trees from being cut down but she lost something precious in return: her time with Tomoya. She then confesses to Tomoya that she wants only him and will follow him to the odd ends. Tomoya is touched by her words and decides to resume being lovers. After Tomoya graduates in spring, he sees both Takafumi and Tomoyo off to school, with both of them admiring the beauty of the cherry blossom. Tomoyo's story continues at Tomoyo After: It's a Wonderful Life, Key's fifth game, a sequel to Clannad, as the main heroine. In the movie, Tomoyo was already a student council president when Tomoya just met Nagisa, and her relationship with Youhei and Kyou is better compared to the game and anime.